We propose to use human pluripotent stem cell technology to study changes associated with type 2 diabetes. Glucose is the main source of energy in human body and its metabolism is primarily regulated by one hormone, insulin, with some contribution of other hormones such as glucagon and somatostatin. Without insulin glucose cannot enter cells and be utilized for basic processes, leading to cell death. Insulin is produced in pancreas, by endocrine beta cells. Abnormalities in insulin synthesis section or action lead to improper glucose homeostasis and development of diabetes. With more than 370 million people worldwide affected with diabetes, almost everyone knows someone who suffers from this disease and the number of new incidences per year is constantly increasing. Traditionally, diabetes is divided into type 1 diabetes, also known as juvenile, more severe but also rare form of diabetes and type 2 diabetes, the most common one. In type I diabetes, the patients own immune system aberrantly attacks the insulin producing beta cells leading to completely lack of insulin and therefore elevated glucose levels in blood. Whereas in type 2 diabetes, various mechanisms, including insufficient insulin production, secretion to glucose sensing, are cause of the high blood glucose levels. Nowadays, both forms of diabetes are not life treating and treatable with exogenous insulin or other drugs, nevertheless often lead to devastating secondary diseases and shorten life span. Many studies so far have used animal models or immortal cell lines to study diabetes that do not fully reflect human disease. 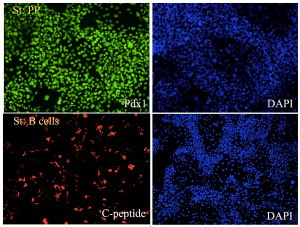 Therefore, in this project, we will use induced human pluripotent stem cells specific to type 2 diabetes and pancreatic differentiation to create human diabetic pancreatic cells including beta cell in a dish. We will then extensively characterize these pancreatic cells on RNA and metabolite levels to determine the molecular causes of the diabetes. Furthermore during this study we will establish complex molecular signatures of human pancreatic cells at different stages of development based on transciptome and metabolome analysis. The genes and pathways changed in diabetic pancreatic cells will be further investigated using the CRISPR/Cas9 mediated overexpression and downregulation to investigate their role in beta cell development and diabetes etiology. By application of careful diabetes subtype selection, human stem cells, pancreatic differentiation and novel technologies we believe this project will aid in understanding the molecular mechanism(s) of diabetes and thus lead to prevention and/or cure in long-term. Lastly, similar principle might be applied to study other cells affected by diabetes i.e. neurons. Skin fibroblast reprograming. 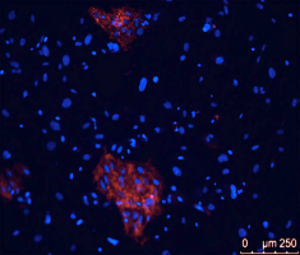 iPSCs derived from diabetes patients express SSEA- 4 (in red). 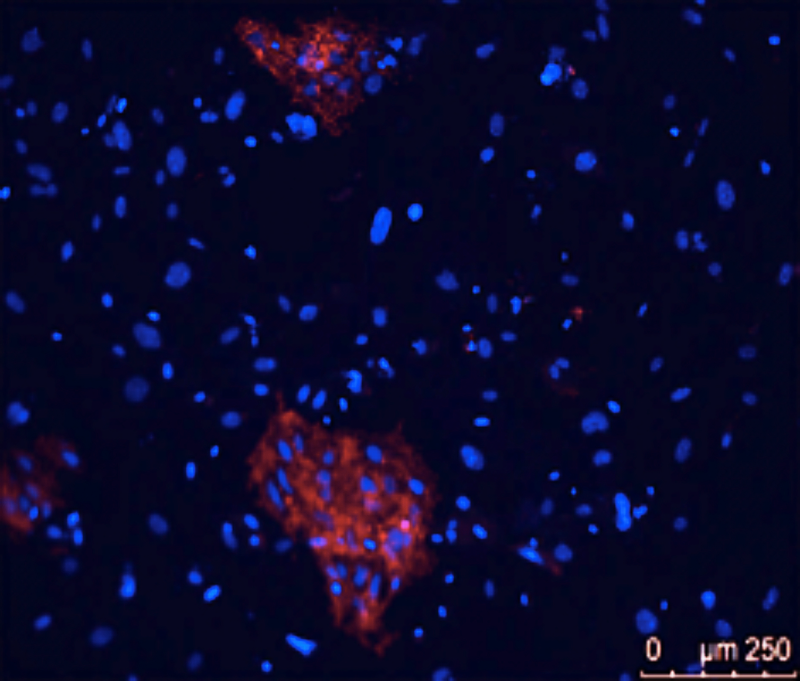 Nuclei are stained with DAPI (in blue). The strategies for pancreatic differentiation in vitro. 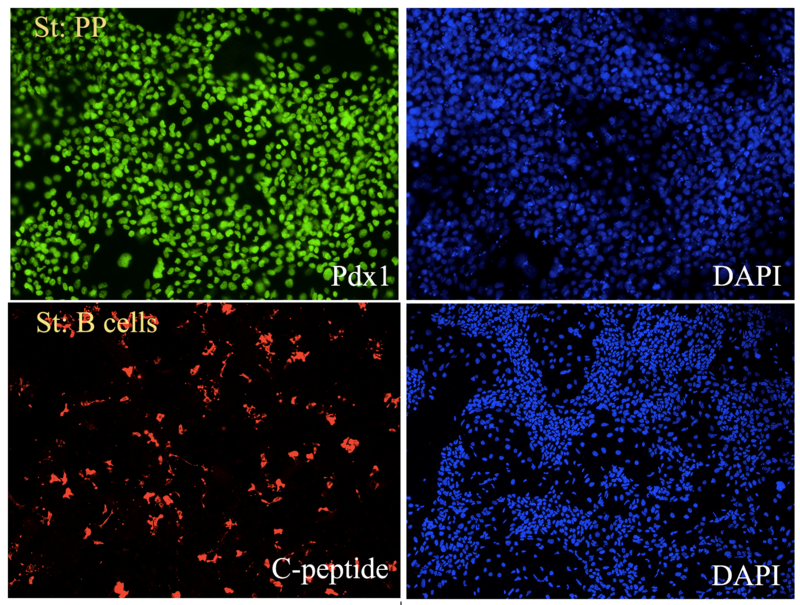 (green) and iBeta cells (bottom) with C-peptide (red). Nuclei are stained with DAPI (blue).